Just like everything else in the body, the eyes often change during pregnancy. Your glasses or contacts prescription can even shift and may not stabilize until six months after you are done breastfeeding! These changes likely occur due to increased blood volume, fluid retention, and hormonal changes. Don't worry, the change is usually minor. So if you were thinking about undergoing LASIK during pregnancy, just wait it out a bit. Hormonal fluctuations can also lead to dry eye. Dry eye can cause redness, burning, and blurred vision. 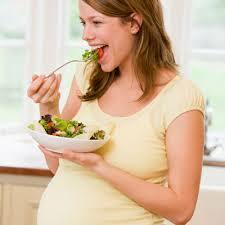 Staying hydrated, and eating foods high in omega-3 fatty acids, such as salmon, walnuts, and flaxseeds, can help. Over the counter lubricant drops can also be used and are safe during pregnancy and while breastfeeding. If a large change in vision occurs, this may signify an increase in blood pressure or the onset gestational diabetes. Call us immediately if the vision becomes very blurry.